I wanted to say THANK YOU for your incredible generosity on behalf of the TeamForKids charity. With your support I was able to enter and run the United Airlines Half Marathon this morning along with 22,500 runners from 80 countries. Because of all of you, I have raised $1,765 via the Team for Kids page, $275 via Venmo, $175 in cash and $40 in Bitcoin during an art party. Thousands of children from underprivileged communities ran through Times Square during the race today! Times Square is only closed on NYE and for the United Airlines Half Marathon. I felt as if I was flying through this iconic destination, feeling the incredible support of a huge crowd and appreciating the sheer size of our beautiful city. 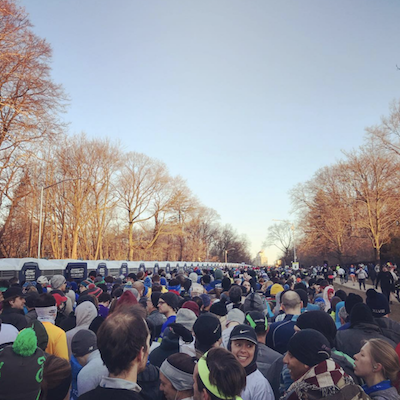 The entire race course, from Prospect Park to Central Park reminded me of how special New York City is, and brought back memories from when I landed in JFK on a PanAm flight from Moscow in 1988. As for the run, I accomplished my personal goal of finishing under 1h45m. My unofficial time was 1h44m32s with a pace of 7m59s per mile. I have improved my average time per mile by 10 seconds since The Frank Lebow Manhattan Half in January! Your support gave me confidence that I can nag enough of my friends to donate money to charity. 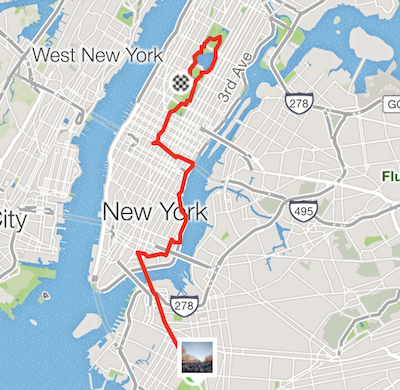 I’ve watched with envy many NYC marathons from the sidelines, never thinking I could run one. And so I will be running the 2018 NYC TCS Marathon on November 4th with your help. I am asking you to support TeamForKids by donating a few tax-deductible dollars here. 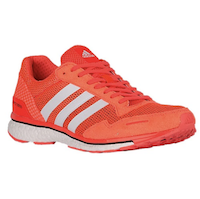 Finally, I also want to take this opportunity to encourage you to run. I have only started running myself in summer 2017. It has given me tremendous vitality and renewed confidence to overcome a challenging time of my life (and I lost 20 lbs :). 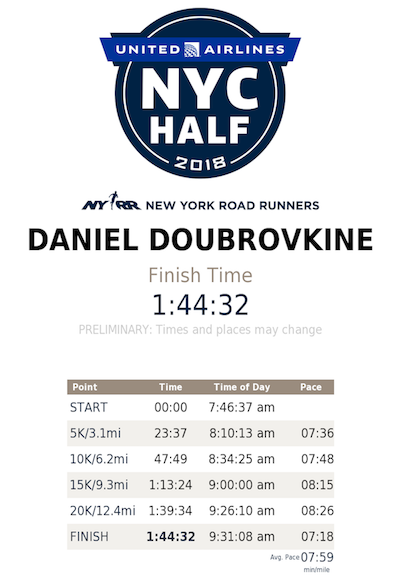 To help you with the basics I have published a blog post on How to Run a Race in NYC. A Big Thank You! was published on March 18, 2018 . See a typo?